"The First Auto Trip Across the Prairies." Source: Thomas Bouckley Collection, Robert McLaughlin Gallery, 715 0667, 1911. I have come to think of my dissertation as a reflection of my way of seeing, both now, and in the past. As a daughter of Canada’s Motor City—Oshawa, Ontario—I was always taught to appreciate cars. I built them, saved for them, crashed more than one; cars represented freedom, cars were valuable. For the people of Oshawa, myself included, cars have long represented more than just transportation. In its earliest depictions of the motor car, the McLaughlin Carriage Co. drew on hegemonic notions of Victorian respectability, gender, and class to market its automobiles to suit the gazes of middle and upper-class men. McLaughlin Carriage Co., Parkwood Estate Archives, 2005 649, 1908(?). A collective identity built around the reality of automobile production in the city is ordered by multivalent sites of meanings, and also dislocated memories. Many things have come to bear on how the dawn of the age of the automobile is remembered in Oshawa, not the least of which is the fact that the city has been economically reliant on automobile production for over a century, and culturally invested in the perceived tradition of this industry. This reality influenced Oshawa’s trajectory toward the cultural sanctification of the automobile, the results of which have deeply influenced conceptions of time, space, and place in “Canada’s Motor City.” My current work tracks the earliest utterance of this dialectical myth, and, in doing so, looks at the extent to which the commemoration of the dawn of the age of the automobile (specifically McLaughlin Motor Car Company advertisements from 1907 to 1918) conveys an upper-class vision of the early autoscape. These depictions sought to naturalize the automobile in the context of harmonious class relations and a relatively heterogeneous transportation matrix. Archive caption: “This photo shows three men sitting in a McLaughlin Buick and another man standing along side (sic). All are identified. 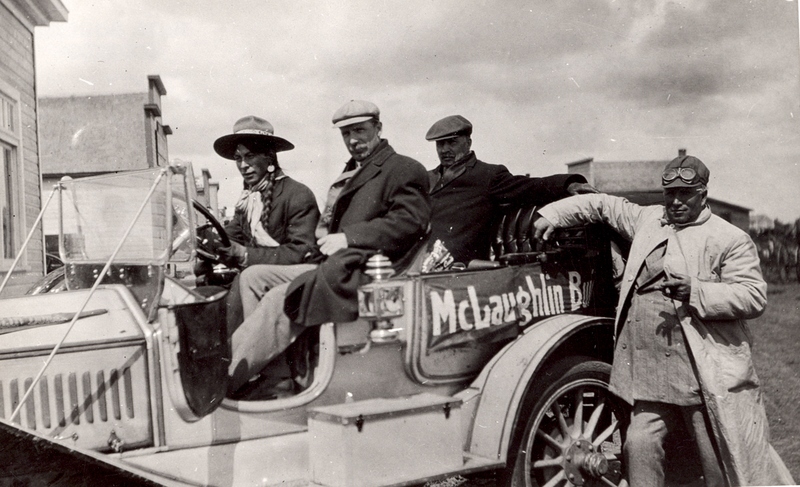 Left to Right: The Indian Guide, George W. McLaughlin, Richard McKenzie (manager, McLaughlin agency, Winnipeg), L. M. Brooks (Owner, Brooks Livery, Oshawa). The occasion marked the start of the first automobile across the prairies – from Winnipeg, Manitoba to Victoria, B. C. via Saskatoon, Edmonton, and Lethbridge. 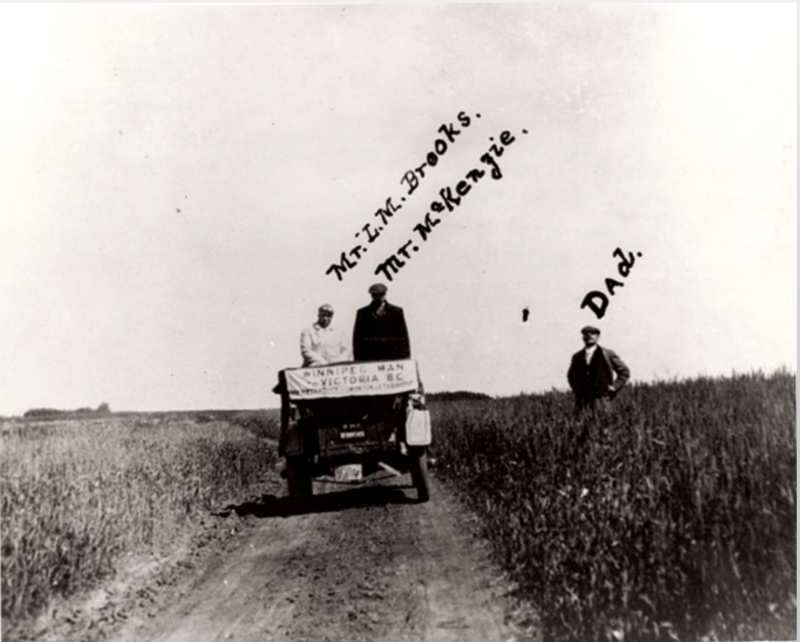 The journey took place in the summer of 1911.” “First Auto Trip Across the Prairies,” Thomas Bouckley Collection, Robert McLaughlin Gallery, 715 0667, 1911. My research has shown that visions of the dominant colonial order were embedded into McLaughlin Motor Car Co. advertisements from the beginning of its automobile pursuits. Canada’s automobile landscape was illustrated in vivid detail, though not always with accuracy, by increasingly sophisticated developments in advertisements during this period. These advertisements, when combined with photographs and memoirs of early automobility, offer a way of seeing the historical contours of social relationships resulting from disproportionate access to auto tourism long before automobiles grew in affordability and utility. It was here that an elite Canadian aesthetic emerged to claim space for the McLaughlin’s first generation of motor cars. 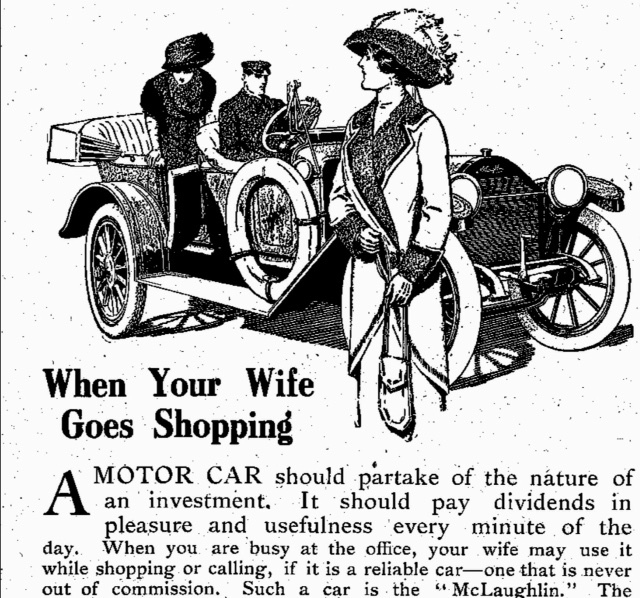 Its subsequent marketing strategies would extend this to middle-class consumers under the slogan “a car for every purse.” Later decades reflected continuity and change in this regard, particularly in the context of the General Motors acquisition of MMCC in 1918, wherein class relations came to be more effectively hidden as automobile advertisements were largely streamlined to reflect a social climate that favoured standard, middle-class whiteness in popular culture. In the 1920s, 30s, and 40s cars themselves came to be increasingly fetishized and democratized in the symbolic realm, though the automobile still faced major areas of resistance in Oshawa. The embodied nature of early advertisements are rendered political when considering the wide chasm of social, political, and economic power between those at the physical and ideological centre of the ads, and those who enjoyed far less social agency. When entertained from this perspective, the diminutive depiction of the black porter, the nameless Aboriginal guide, the shopping woman, and the obedient chauffer sought to reinforce the racist, classist, and gendered realities of this time and place. Claiming space for automobility and the McLaughlin Buick in western Canada. “First Auto Trip Across the Prairies,” The Thomas Bouckley Collection, Robert McLaughlin Gallery, 719 0671, 1911. Space, time, technology, race, class, and gender intersect in this advertisement to reveal upper class ideas about leisure, travel, and the benefits and limits of early automobility. 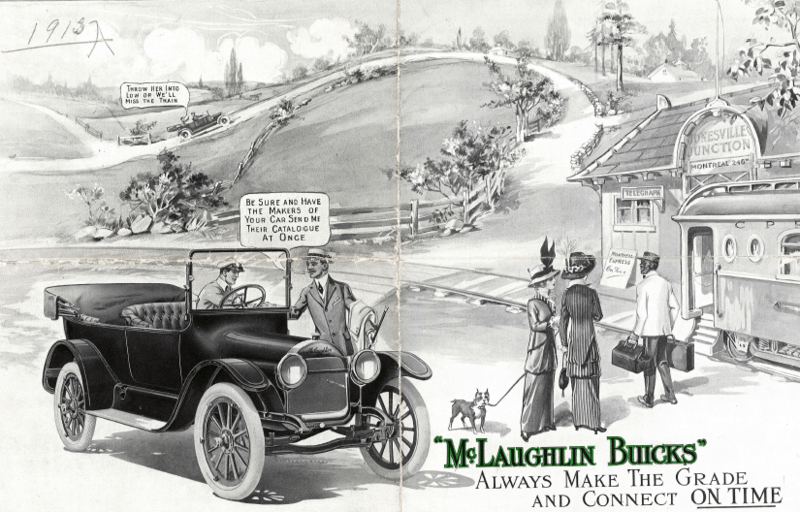 McLaughlin Buick advertisement, McLaughlin Motor Car Co., Parkwood Estate , 2005 1618, 1915. In Oshawa, the cultural realm worked to construct the dawn of the age of automobile at least two decades before widespread automobility was realized in the physical realm. In spite of the fact that the city’s physical landscape was not yet adapted to the needs of the automobile, as early as 1920, advertisements and newspaper articles encouraged residents to commemorate the coming of the age of the automobile, and the McLaughlin family’s “benevolent” and “pioneering” investment in industrial prosperity for the city. In innumerable ways, this happened through a didactic narrative which legitimized automobility through the overlapping discourses of progress, modernity, and tradition. In a broader national context, the McLaughlin family was also responsible for mapping the automobile onto Canada. Although this happened through local touring, it also took place in the context of a national marketing project that sought to claim space for McLaughlin carriages and sleighs (1878-1915), and later automobiles, on a national stage. In this way, the company’s conception of the automobile, and transportation more broadly, ran parallel to hegemonic ideas of class, gender, and race during this period, and efforts to claim ideological and physical space for national automobility. 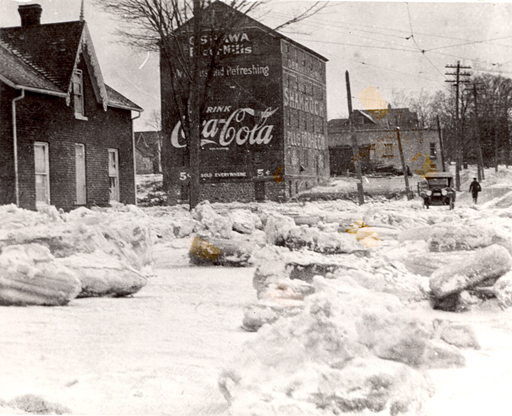 This image looks east towards what was to become Oshawa’s downtown, and shows the extent to which the realization of the automobile landscape was temporally and physically removed from the cultural conception of this ideal. ‘Spring Flood in the “Hallows,”‘ Thomas Bouckley Collection, Robert McLaughlin Gallery, 394 0355, 1922.